The Tormented Spire is a volcano in southwestern Stonefalls, in the Varanis region, east of Kragenmoor. 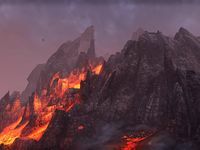 Many Daedric ruins can be found inside the volcano's caldera. The upper parts of the volcano could be accessed only with a key kept by House Dres in Kragenmoor. The volcano served as an entrance to Sadal's Prison, a small realm of Oblivion designed to imprison Sadal, one of the Brothers of Strife. In 2E 582, Tanval Indoril, the grandmaster of House Indoril, climbed the Tormented Spire and unleashed Sadal to exact revenge on the Daggerfall Covenant for the death of Tanval's son, Garyn. However, Sadal was too dangerous and had to be subdued. With the help of the Soulless One, Sadal was defeated and bound again before he could return to Tamriel. This page was last modified on 24 June 2018, at 16:54.